Inspired by the pin dog as featured on The Great British Sewing Bee series II, I was delighted to find a pattern through SEW magazine. 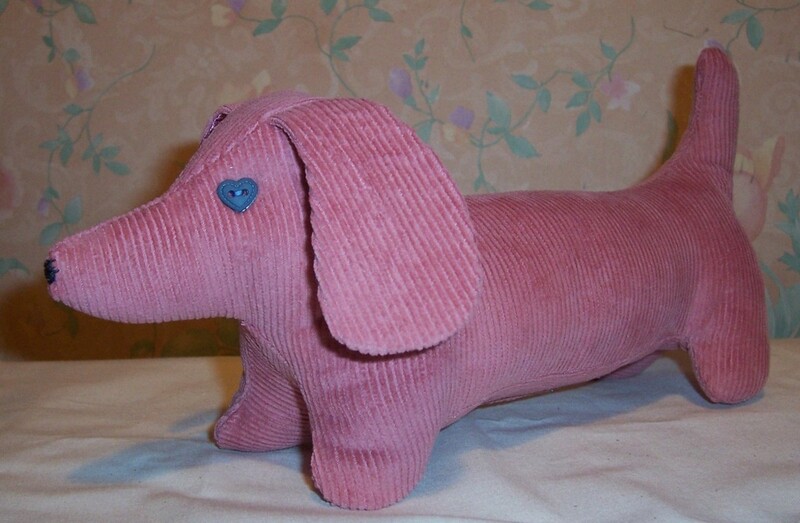 I downloaded the templates some time ago and have only now got around to making up the Dachsund. I used some scraps of Pink needlecord left over from a Trouser Suit project and lined the ears with Pink satin also left over from a Boned Bodice Workshop that I tutored several years ago. The eyes are Blue heart-shaped buttons and the nose is hand worked using a double thread in Black. This was a really quick sew, what took the most time was the stuffing with polyester fibre filling. 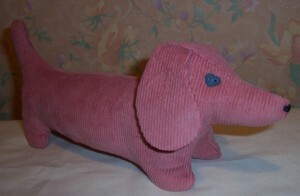 Dolly measures approximately 12″ from the tip of hernose to tip of her tail. I have yet to make the “coat” for Dolly and apply a collar and tag but for now she sits in pride of place next to my sewing machine.